Don Riggs, Bilateral Asymmetry, Poems. Texture Press, 2014. Pp 114. ISBN 978-0-692-21272-1. $17.00. When we discuss genre writing, poetry often gets left out, ignominiously, despite some of the great practitioners of the form: Tolkien, of course, wrote elegiac verse for and in his legendarium; the poems of Ursula K. Le Guin and Jane Yolen echo the concerns and themes of their prose works. Speculative poetry, like speculative fiction, explores possibility through form as well as content. 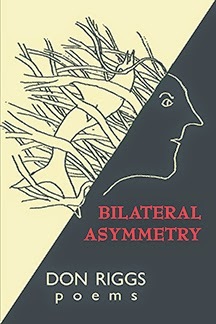 The poems, calligrams, and illustrations in Don Riggs’s new collection Bilateral Asymmetry play with the mythic and the esoteric, inviting closer readings to deceptively short texts. The titular poem, appearing purposefully almost-but-not-quite halfway through the book, reflects on the asymmetry of the physical and the mental. “The left side, where the heart lives, the right brain / loosely directs, taking a wait-and-see / attitude” reflects the preoccupations of art interlocked with life that make up the rest of the volume (63). Riggs draws his subject matter from personal experience and reflection, recalling memories interchangeably with books read, paintings viewed, poems pondered. In some ways this recalls the experimental style of David Markson’s novels, which seamlessly combine brief snippets of literary and historical facts with authorial commentary to produce holistic narratives. Riggs utilizes personal drawings to evoke the sense of walking through an art gallery—indeed, the first set of five poems are titled ‘Gallery Opening.’ This is actually much more effective than twee; it emphasizes the intellectual interchange between word and image, and invites the reader—especially in the word-picture calligrams—to consider how the two forms interact with one another to create another narrative outside of the singular poem. ‘Real Magic,’ which “involves metamorphosis / of one thing into a wholly other” offers itself as a kind of thesis to this way of reading, as it compares looking into a children’s book with retelling the tale of a phoenix—and then an accompanying image of a phoenix itself (105). In another poem, ‘Uber Blumen Und Madchen, nostalgia for a lost mistranslation,’ Riggs asks, “I can always translate from a text, but / how can I translate something from the past?” (85). Though part of a series of poems reflecting on Rilke as well as the act of writing poetry, the lines invite reconsideration of the other pieces that play on memory. The act of autobiographical writing is peculiarly difficult because of, as the author acknowledges, nostalgia—and that difficulty of translation. The past is always a foreign country; its language more so. The act of writing memory—or even transmuting it—is a familiar one to poets, but Riggs’ ability to make it a quasi-fantastical act transforms it in another way, making those particular poems more like miniature short stories than only vignettes. While far from expert in poetry, I do appreciate this take on the form as being distinct enough to be worth remarking on further. The poem ‘Agricultural Research Station, Beltsville, MD’ recounts a childhood visit to Riggs’s father’s workplace. He describes—and also draws—a cow with a window in it; the image is sufficiently bizarre to invite comparisons to magical realism rather than outright fantasy (or memory). Other poems, like ‘The Elves Know’ or the five poems in ‘Dealing In Futures’ play with more standardized genre fare. ‘The Elves Know,’ with its accompanying illustration of a long-locked and lackadaisically slouching elf, automatically invokes memories of Tolkien, while the ‘Dealing in Futures’ poems play with the mystical iconography of the Tarot. ‘Four of Pentacles, after a card by Boris Vallejo’ includes a playful cartoon of a buxom warrior woman which is very much at odds with the hyper-sexualized imagery of the well-known genre artist. (Vallejo’s art for a proposed Tarot with his partner Julie Bell has appeared partially in the magazine Heavy Metal.) That artistic intersection, as well as the intellectual one between the spiritual nature of the cards and the sensuality of the art on them, emphasize the exuberance of such disjunctions. The subject matter of Bilateral Asymmetry is probably further afield of what readers of The Future Fire typically look for, and yet, as I mentioned before, genre poetry tends to be overlooked enough that seeking it out is worthwhile. This volume is a well-written, thoughtful exercise in genres, and is more “user-friendly” than other such books I’ve come across recently (I’m thinking particularly of the intellectual convolutions of Tracy K. Smith’s otherwise praiseworthy collection Life on Mars). What is perhaps a little lacking in terms of originality of subject matter is more than made up for in originality of turns of phrase. Riggs does not hit the reader over the head with his belles lettres, but lets it sink in gently. When the reader looks up from having concluded the book, there is more the sensation of having finished a lovely, thoughtful story collection than a volume of verse. This was an especially fine collection, hybrid of art & poetry.